Balloons for all occasions, and there’s no better way to send your very best wishes on their special day in Maghull than with one of our magnificent floral bouquets with a balloon. we’ve got bouquets of helium balloons they’ll love. If you decide to choose a bouquet made by Alison's Designer Florist Maghull, Liverpool you can do so with confidence, knowing that it will also be hand delivered on your behalf, giving your Anniversary order a personal touch that means so much. Sending flowers to Maghull, Lydiate, Melling, Aintree, Aughton, Ormskirk, Bootle,Liverpool and surrounding area of Merseyside has never been easier, quicker or more reliable. Let us help you make someone’s day a day to remember and choose to send flowers to Maghull with us. This eye-catching 18th birthday balloon is radiant with an array of metallic rainbow colours and sil.. This eye-catching 21st birthday balloon is radiant with an array of metallic rainbow colours and sil.. This eye-catching 21st birthday balloon bouquet is radiant with an array of metallic rainbow colours.. 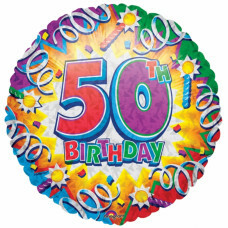 This colourful 30th birthday balloon has a brightly coloured stripes and spots design and a big ’30!.. This eye-catching 30th birthday balloon bouquet is radiant with an array of metallic rainbow colours..
Make them feel special on their 40th with this celebratory birthday balloon. The design includes an .. 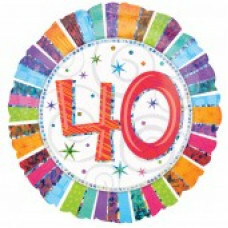 This eye-catching 40th birthday balloon bouquet is radiant with an array of metallic rainbow colours.. Send a helium filled birthday balloon and give their 50th birthday a dash of colourful fun. This eye.. This eye-catching 50th birthday balloon bouquet is radiant with an array of metallic rainbow colours.. This eye-catching 60th birthday balloon bouquet is radiant with an array of metallic rainbow colours..
Add a sense of fun to the occasion with this cute baby boy balloon. The ‘baby boy’ blue and white de.. This eye-catching Baby Boy balloon bouquet is radiant with an array of Blues and pastels sparkles – .. Prompt a smile with this pretty balloon, perfect for adding some fun whilst celebrating their new ar.. This eye-catching Baby Girl balloon bouquet is radiant with an array of Pinks and pastel sparkles – .. This eye-catching birthday balloon bouquet is radiant with an array of metallic rainbow colours and ..